Bearing a modern sleek look, this 30” Range Hood by AKDY bears a contemporary Euro Design featuring glass and Stainless Steel. As it’s a wall mount range hood, only 3 sides are of steel and the other side is hollow, it’s going to be on your wall after all. Therefore, there’s no chance you would be able to use it as an Island Installation. To maintain the internal environment of your home and also keep your energy bill at a minimum, this range hood is fitted with a non-return air flap that prevents the heat from escaping whenever you’re not using the hood. As you can see from the image, it’s made of stainless steel and has a classical brushed stainless steel finish to give it the extra shine. In addition to that, for greater beauty and to increase the catchment area, it’s got tempered glass wings. Well, there’s a lot of hype about the installation of this particular range hood. There are a few people who’ve complained about the instruction manual. Yes, the manual isn’t that well off as it seems to be translated from Chines by someone who wasn’t really good at their job. Therefore, the manual as a whole isn’t really helpful. However, installation is not at all difficult because it’s a wall Mount Hood, the side that doesn’t have a covering goes onto the wall. You need one wall mount bracket with two protruding tongues. The range hood just slides into these tongues. Once this is done you just need to vent the hose and plug it in. It’s not complex at all. 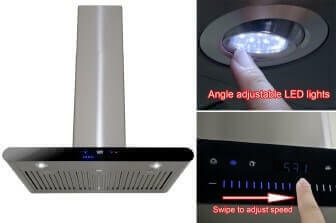 You could always look up YouTube to find videos based on wall mount range hood installation for guidance if needed. Noise is less than 65 db. It’s kind of loud but bearable. 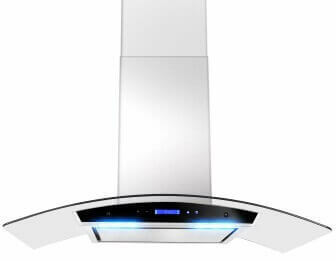 You may say that you’re not going to get a lot from a wall mount range hood at this price. Well, that’s what most people have thought before they bought it. You can check out reviews on merchant sites such as Amazon and you’ll see people are all praise for this model. It’s not the quietest of range hoods, but it’s not one that you would want to run away from either. You would peacefully be able to stand in your kitchen and cook while it runs in the background. It does its job really well and gets rid of all fumes. The bulbs on the other hand aren’t really that great and wouldn’t be sufficient to light up your kitchen themselves. You’re going to need additional lighting. 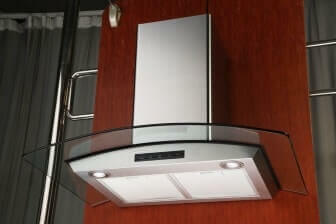 This range hood can be converted into a recirculating hood if you wish. 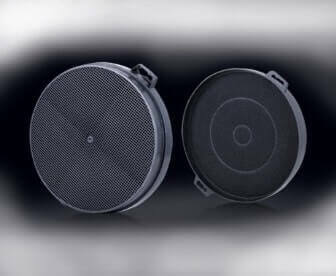 All you need to do is purchase additional carbon filters and put them in place and the job is done.